In the Nov. 6 general election, Alaska residents will be asked to adopt strict new permitting regulations for developing any projects with the potential to affect salmon habitat. Supporters of Ballot Measure 1 argue that the current permitting rules are outdated and ineffective. They're asking voters to adopt eight pages of new policy that would, among other things, require state regulators to write specific scientific standards to define salmon protection and habitat. 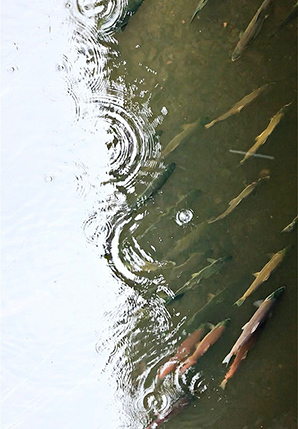 "The current law has two words for the standard for protecting salmon habitat: It requires the 'proper protection' of wild salmon," explained Cook Inletkeeper Bob Shavelson, an activist in the Stand for Salmon campaign. "Right now, there are no rules that define what 'proper protection' means," Shavelson said. "So when you get into a political context, you see major decisions being made for political purposes and without public input." The Stand for Salmon initiative would require the state to hold public hearings before permitting decisions for some of Alaska's largest new industrial projects on the drawing board, notably the controversial Pebble mine and the Donlin Gold mine. Not surprisingly, the state business community is fiercely opposed to the ballot measure. They insist that regulators and scientists in the Alaska Department of Fish and Game already have all the authority and discretion they need to protect salmon habitat. 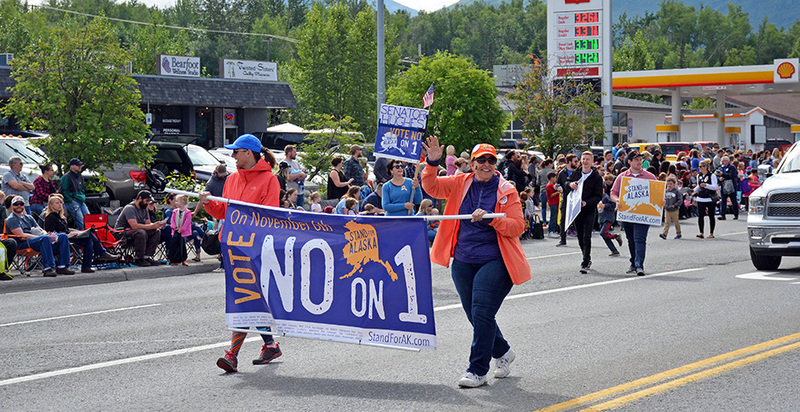 Kati Capozzi, campaign manager for the Stand for Alaska/Vote No on One campaign, charged that the ballot initiative goes far beyond simply updating the law, and will add complicated red tape that will affect private property owners and companies alike. "This is a complete overhaul," Capozzi charged. "This throws out 60 years of science, 60 years of precedent, and replaces it with something entirely new, untested." She warned that the salmon proposition would also open the door to an avalanche of lawsuits. "They'd made it hard to go through the permitting process," she noted. "And then, if someone doesn't like the decision that the state commissioner of Fish and Game makes, they'd also allow anyone to sue. "It will be a lawyer's paradise." Alaska's top two candidates for governor are locking horns over the salmon proposition. Democratic contender former U.S. Sen. Mark Begich strongly supports the initiative. His opponent Republican Mike Dunleavy, a former state senator, is diametrically opposed. Alaska Gov. Bill Walker (I), who dropped out of the governor's race late last week, was also opposed. The state's largest resource companies are writing big checks in hopes of persuading the public to vote against the salmon initiative. As of Oct. 23, contributions to the Vote No group had climbed to more than $11.6 million, making it one of the highest-priced political battles in Alaska history. Nine of Alaska's major corporations have each contributed $1 million or more to the opposition group. The million-dollar donors club currently consists of Alaska's three major oil companies: BP PLC, ConocoPhillips and Exxon Mobil Corp. It also includes mining giants Coeur Alaska Inc., Donlin, Hecla Mining Co., Kinross Gold Corp., Sumitomo Metal Mining Pogo LLC and Teck Alaska Inc. The funds are being used to deluge Alaska voters with television, radio and newspaper ads, as well as social media advertising, roadside signs and door-to-door canvassing. Capozzi said the Vote No campaign has more than two dozen employees and 500 sponsors who represent Alaska Native corporations, trade unions, businesses, industry organizations and corporations that do business in the state. Meanwhile, ballot initiative sponsor Stand with Salmon is running a largely grassroots, volunteer campaign. As of Oct. 22, the group reported $600,000 in campaign contributions, most of them from small donors. Ryan Schryver, director of the Stand for Salmon campaign, said nearly 400 Alaska businesses, organizations and community leaders are backing the group. "We have a fundamentally different strategy and path to victory," Schryver explained. "It's made up of Alaskans talking to other Alaskans. "We're going door-to-door. We're talking to community groups and card clubs and sewing circles. We believe that an Alaskan talking to another Alaskan face-to-face has much larger impact on how that person will vote than TV commercials." Stand for Salmon says its top financial contributors are three state environmental groups: the Alaska Conservation Fund, Alaska Center and Cook Inletkeeper. However, the industry-backed Vote No group has filed a complaint with the Alaska Public Offices Commission charging that the salmon initiative group is getting "dark money" from environmental organizations with ties to liberal foundations located outside of Alaska. They also note that Schryver is being paid by an outside group, New Venture Fund, a Washington, D.C.-based nonprofit. At the Vote No group's request, the state commission held an emergency hearing last month on those charges. But the regulators deferred action on the issue until its staff completes an investigation of the issues involved. That report could be released shortly before the November election. The Stand for Salmon campaign picked up momentum this summer as Alaskans increasingly worried about the decline of the state's famous king salmon runs in several parts of the state, including tourist meccas on the Kenai Peninsula. Schryver said his group is not blaming the low salmon runs on the state's industrial projects. "I want to be very explicit about that — we have not made that claim anywhere," he said. "The causes for salmon run declines are complex. They include ocean conditions and global warming, which are impacting the health of the salmon population." But, he added, "biologists and fish experts tell us that when salmon runs are in times of stress, the absolute most important thing that you can do is make sure that they have healthy habitat to return to." Vote No's Capozzi conceded that the Stand for Salmon slogan is powerful in a year when salmon fisheries are in decline. "The Stand for Salmon people have this really great bumper sticker — they say they stand for salmon," she noted. "It's emotional. But, well, we all stand for salmon. So what we're doing [in their public education campaign] is explaining what this is all about." Both groups are also paying for public opinion polls, but neither is sharing the findings. The ballot initiative comes at a time when mining and oil companies are moving forward with an ambitious lineup of new projects in Alaska and just as the state begins to recover from an economic recession. Several mining companies are poised to open massive new projects or expand their current ventures in Alaska. The two biggest operations on the drawing board are Donlin Gold's ambitious mining project in southwestern Alaska and the contentious Pebble gold and copper mine located in the headwaters of Bristol Bay, one of the world's largest sockeye salmon fisheries. Meanwhile, Pebble LP is pushing the Trump administration to approve plans for its controversial copper and gold mine and is pushing EPA to scrap its Obama-era proposed restrictions on the project. At the same time, oil companies are at the brink of an oil development renaissance on Alaska's North Slope. ConocoPhillips Alaska Vice President Scott Jepsen recently predicted that proposed new drilling projects in northern Alaska could bring more than $13 billion in capital investments and thousands of new jobs. And that doesn't even include promising new oil fields in the National Petroleum Reserve-Alaska, in the Arctic National Wildlife Refuge or on state lands. At a recent state legislative hearing, Jepsen said ConocoPhillips alone has discovered between 500 million and 1.1 billion barrels of oil over the last two years. He described the company's outlook in Alaska as "very robust right now. It's really stunning." But he warned that some oil projects could be delayed or canceled if Alaskans approve the proposed new salmon habitat rules. The ballot initiative, he said, "would be a big drag on development. It lays out a path for a lot of litigation, lays out a lot of uncertainty with regard to how fish habitat permits are being managed today." Stand for Salmon campaign advocates traveled a bumpy road on their way to putting the salmon initiative on the state ballot. Schryver said advocates for tougher salmon habitat laws first joined forces five years ago when the state Legislature was debating H.B. 77, which would have made it easier to obtain construction permits. "That legislation was all about removing even some of the minimal protections that we have for salmon habitat right now," he said. "It was a real threat to state sport and commercial salmon fishermen, and subsistence users, and they all worked on it together." After helping to defeat that state bill, the loose coalition formed a nonprofit group in 2017 and began working with some conservation-minded state lawmakers to introduce tougher salmon habitat legislation. But those bills were aggressively opposed by state industry groups and never emerged from the state House Fisheries Committee. In May 2017, as the legislative debate continued, the Stand for Salmon activists decided to take their case to the voters, filing an application for a state ballot initiative. "There were warning signs about the overall health of our salmon runs, and we wanted to act quickly to protect the salmon habitat," Schryver explained. "That's when people started talking about running the ballot initiative." Former Alaska Lt. Gov. Byron Mallott (D), who managed state elections before resigning suddenly last week, initially rejected the application, arguing that the proposition was overly broad and in violation of the Alaska Constitution. But his decision was overruled by the Alaska Superior Court. Mallott appealed, triggering an Alaska Supreme Court review. In August, the state's high court acknowledged that part of the Stand for Salmon initiative violates the Alaska Constitution. But the judges directed the state to remove "the problematic sections" from the measure and to place the rest of the language on the ballot. The court excluded sections of the initiative that would have prohibited the Department of Fish and Game from granting permits to projects that would cause "substantial damage" to waterways used by anadromous fish. As the Nov. 6 election draws near, both sides of the salmon initiative debate are passing out additional road signs and sending speakers to talk to voter groups around the state. "We've had something like 20 events a week recently," Capozzi said. During the next two weeks, the groups will pour their blood, sweat and money into convincing their supporters to vote early or to go to the polls on Election Day. Both campaigns said they're hoping for a high voter turnout. "The more Alaskans that are weighing in on this thing, the better off we are going to be," Schryver said, "because salmon connects so deeply with so many different Alaskans." "We're confident that whoever shows up at the polls, they're going to check the box and vote yes for salmon."